This is a lovely historical hotel, the former mansion/palace was built using part of the Arab town wall. 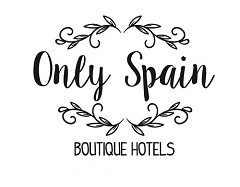 Now a rustic boutique hotel with 20 rooms of differing standards and sizes on the edge of the Natural Park – Sierra de Andujar. The town itself, Baños de la Encina, must be explored and as the hotel is only 6km from the main Madrid to the Costa del Sol road it would make a great stopover as well as a great base to explore inland Andalucia and Jaen province. With a lovely exterior dining area with far-reaching views and an air-conditioned restaurant it’s better to dine in, the town although charming only offers basic bars rather than decent restaurants. I loved all the details and old objects used for decoration in both the rooms and public areas. The original tiles in some bedrooms, rustic woodwork and roof beams. Some of the furniture wasn´t really of style but overall it´s a charming hotel. or book Hotel Palacio de Guzmanes immediately via Booking dot com. What to See in Baños de la Encina? The huge, oval castle – Castillo de Burgalimar on OnlySpain´s Blog.